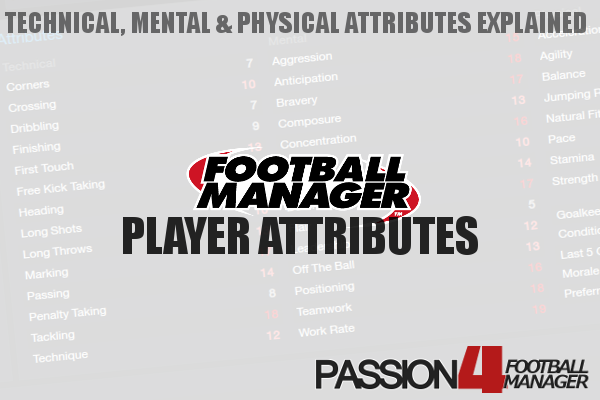 Welcome to the complete guide about the Football Manager Player Role Combinations and duty Pairs by llama3, which has been updated for Football Manager 2015 and released as a pdf file. The complete guide to pairs and combinations can be downloaded / read in the bottom of this post. Here, the Sports Interactive Football Manager Tactics moderator llama3 analysis the best pairs, player role combinations and how to benefit from lone striker tactical setups, to double wide men or utilizing a back three. This in-depth Football Manager guide provides you with some basic principles of player duty combinations that is worthy for creating a successful tactic which exploits spaces between lines, is more defensive solid or simply creates more chances through a good player role combinations; destroyer / creator partnerships. Llama3’s player role and combination guide is a great appendix to ‘The Hand of Gods’ complete series relating the Football Manager Mentality ladder and players rung of responsibilities for the different mentality structures. It serves as a great appendix to the previous released post about 11 essential tips to improve your Football Manager tactics which provided you with some core principles for tactical design in Football Manager. This guide serves a great appendix to another comprehensive Football Manager guide: The Mentality Ladder by ‘The Hand of God’. You can read the full guide here. Goalkeepers are still an important part of your team’s tactical setup. Their distribution and sweeping up are significantly linked to your overall team style of play, and the players in your team. A well set-up goalkeeper can significantly improve your team’s performances. A defender collect option works well with building play from the back, and works particularly well when you have a good creative outlet, like a ball-playing defender, a deep lying playmaker, or a regista, who can help create chances from a deeper position and help maintain possession. A quick throwing option supports a more direct counter-attacking approach, appears to suit distribution to full backs/wing backs (who naturally tend to have the most space from the back) and helps speed play out from the back at a much quicker tempo. The long kicking approach significantly suits a more physical taller option further up the field. If you play a Target Man or a Wide Target Man, these are highly suitable options to “distribute long towards” – this works well if your team is being pressed at the back and you are struggling to play the ball out from the back. A Sweeper Keeper can provide more creative options from open play, and suits a counter-attacking game from the back in terms of his distribution. A Sweeper Keeper will sweep up in front of, and wide of the penalty area. He can compensate for a high line and the offside trap being breached. A normal Goalkeeper will hold position far more, and as a result, tends to suit being sat behind a deeper defence, claiming crosses and distributing the ball safer. If you have a higher line it may be more appropriate to try and beat the opposing forwards to the ball instead of standing up and facing a shot, where the opponent has time to set himself. It may be less essential to play a Sweeper Keeper if you have a Sweeper/Libero, or if you have a Defender on a Covering duty. For the next part I will look into the central defensive set-ups, and how to achieve a cohesive backline. I will discuss common central defensive pairing, and then the less common central trio with the aim to create a better defence. The player roles are fairly similar in most respects, and defensive distribution is the most significant difference in the roles. The Limited Defender tends to simply clear the ball as far away from goal as he can – ensures you do not get caught in possession at the back, but it does turn over possession to your opponents quicker and can leave you under sustained pressure – A good idea if your team does not possess the skill to keep hold of the ball in the backline. The Central Defender will distribute the ball to nearby teammates, helping you keep possession in the backline, and to calmly distribute the ball to the midfield. There is the risk of getting caught in possession at the backline, however it can alleviate pressure on your backline by keeping the ball, and building attacks and distributing the ball to players in the midfield capable of influencing the game in the middle and final thirds. The Ball Playing Defender will look to influence counter-attacking opportunities by playing through-balls in to players wide of, or in front of himself. He can also help the team maintain possession with his superior passing skills and licence, although he must me fairly creative and a good passer, otherwise you can turn over possession if your player tries overly ambitious passes he is not capable of. You can pair Limited Defenders as they do not affect the balance or overall passing structure as they simply play direct, same with a pair of Central Defenders who simply play a short passing game. The Ball Playing Defender however plays through balls, and due to the increased creativity should generally only be paired with just a simple Central Defender – this is because the Central Defender can help maintain possession at the back, passing to his more creative partner instead of hoofing the ball clear like a Limited Defender and his “safety-first” approach. Having 2 Ball Playing Defenders can see your defenders playing with too much creativity, and attempting too many risky passes. The duties provide the variation in defensive approach, and these can significantly change the way your defence balances. The Defend duty is the standard approach, aiming to defend merely as guided by team instructions on marking and pressing, holding the defensive line and winning the ball when appropriate. It is a balance of the 2 “extremes” offered by the Stopper and Cover duties. The Stopper duty aims to step up early to engage the opposition and quickly win the ball back. This can expose your team and open up space for your opposition, stepping ahead of your defensive line. The Cover duty will drop off to try and catch any players breaching the defensive line. This can leave your opponents more time and space just in front of your defence unopposed, but it can also prevent your opponents from breaking through without a player to cover and track their runs, reducing their chances of getting a clean shot away in behind. You can play most combinations of duties in the backline, however most importantly you CANNOT play a pair of Stoppers or a pair of Covering Defenders. The Stoppers will expose too much space in behind, and the Covers will gift too much room in front of the defence, and fail to challenge for the ball often enough. Both pairings can badly expose your Offside Trap too, by either allowing room behind the full back’s or behind the centre backs, played onside by the full backs. The Defend-Defend pairing tend to stay in line better and are significantly better for shape retention, and playing an Offside Trap. The Stopper-Cover pairing tends to exaggerate the best qualities of each individual, with an aggressive defender to attack the ball early, reducing room for the opposition forwards, and the covering defender can make up for the aggressiveness of the Stopper with his excellent positioning and pace. The Stopper can make up for the Covering Defender’s deeper positioning and sometimes lack of aggression by closing down the space in front of the defence. This pairing can cause problems maintaining the Offside Trap with the Defenders in line, allowing gaps for your opponents to exploit. When playing 3 at the back, you have to consider the implications of the wide players, and their positioning. If your full backs/wing backs are fairly attack-minded then your wide central defenders will have to be able to cover the space left out wide. Having a back 3 can take a player away from the flanks or the central zone in the pitch, and if this back 3 can help with this attacking deficit it is useful. The general theories are that you can either keep your entire defence in line, preserving your offside trap and shape by keeping all on the “Defend” duty. You can have Stoppers out wide, closing down opposition wide players to prevent crosses coming in, leaving 2 defenders in the centre to challenge the opponents, with the Covering defender capable of tracking the runs of players in behind the Stoppers. You can invert this by having a Stopper to close down space in the centre, forcing the ball to be played wide, and Cover the balls into the channels for the opposition wide players to chase in behind. NOTE! Your defensive roles affect your defensive distribution, and duties affect your defensive approach. Defend duties stay in line better, with Stopper and Cover duties useful in tandem closing down and tracking space and runs, but at the expense of your offside trap. Make sure you consider the space you vacate on the flanks if you play 3 at the back, and consider your approach to possession and your player’s individual capabilities when assessing your roles and duties selection. The aim of this guide is to help people come up with a logical selection of instructions when selecting the roles for their team. This will advise on some of the aspects and issues to consider when you select the roles and duties for your team. The guide is in 4 parts, but these parts all relate to each other, and cannot be considered in isolation. A Striker’s role is closely linked with the midfielders behind him, and the wide men, which in turn affects the responsibilities of the full backs which can again knock on to a central midfield pairing’s instructions, etc etc. The central midfielders have a massive responsibility in the team, and depending on your formation, have very different demands. For instance, the central pairing within a 4-2-3-1, will be much more defensive than the trio in a 4-3-3. As you can tell, its a lot for 2 men to do. Without doubt, the first aspect that must be achieved is to have some protection for the defence in the centre – this means that 1 of your 2 central midfielders will almost certainly need to be given a defend duty. If you do not, it will be too easy for opposing teams to simply waltz unchallenged through the centre of your team, at pace, giving your central defenders little realistic chance of stopping them. – You may notice the exclusion of a Ball-Winning Midfielder – he should only be paired with an above indicated sitting midfielder, as a Ball-Winning Midfielder does not hold position, and this can significantly expose your team. He can be very effective defensively when paired with another more disciplined player, and does provide late support to attacks too, although he is hardly creative and can be simply industrious. – The Deep-Lying Playmaker (Support) you will see is included in that list, as he can bring the ball forward, but ultimately still holds the ball up and holds position, but he can link play and create chances too. His forays forward with the ball are fairly rare, but can expose the team when these break down – he also sits higher up the pitch, and is more likely to break position to challenge an opponent, so should be considered carefully before using as your most disciplined player. – A Regista simply does not suit the role of most-disciplined player, and must be paired with someone who will sit and protect – therefore a Ball-Winning Midfielder is unlikely to provide good positional cover due to that tendancy to go searching to win the ball. The part of such a pairing is a more variable role, as this player is required to try and link play, create, and support attacks, which is not exactly an easy job. He can be a runner, designed to link play and provide a passing option, or late surge further up the pitch, or he can be a passer, aimed more at keeping the ball moving, and provide a through-ball or creating a chance. The issue without having an outright direct attack-minded player in the midfield, is that you will leave 1 player to perform all defensive duties, and both are likely to become quite isolated from each other too, meaning it is harder to hold possession or build meaningful attacks. The Ball-Winning Midfielder as discussed above, has more licence to push and hassle high up the pitch with a partner who sits in behind to keep hold of the ball. You will notice as well the lack of a Deep Lying Playmaker (Support) from the list – he does not make enough forward runs to seriously support the attack. As part of a 3-man midfield he will be very well suited, but as part of a 2-man system, it will simply isolate your attack from midfield support. Finally to note, the Defensive Midfielder (Support) can be a very effective runner from deep, and still provide support in the final third of the pitch, a very useful player in a counter-attacking system, yet he still retains an excellent defensive position, and can form a formidable pair with a disciplined sitting midfielder. Midfield trio’s are in the vast majority of cases built around a “2 and 1” triangular set up, with the single player at the base protecting the defence, or at the head, spearheading the attack. A flat midfield trio reduces passing options considerably, the only real benefit is making your midfield harder to play through. So otherwise I would stick to a triangular set up. The formation plays a large part in what is required of your central midfielders (in a pair, or in a trio), but the 2 variants of the triangle require different set ups. The “AM” Triangle consists of DM-DM-AM or MC-MC-AM – they are fundamentally the same, but the DM’s provide better protection in front of the defence, and the MC’s provide better pressing of the opposition, as they are stationed higher up the pitch. This midfield set up consists of 2 more defensive players, and a more attacking player. In almost all central midfields, you will require at least 1 defend duty, and 1 support duty – the addition of a 3rd duty means you can choose generally to have another support duty or an attacking duty (the attacking duty is probably better for the balance of your team – the sheer fact you have 3 central midfielders means your attack is often more isolated, and depends more on midfield support – so the extra forward runs are important). If you refer back to the 4 general duties of a central midfield, you can specialize them a little more by spreading the tasks around. Your AM is a good bet for supporting attacks, and creating chances – so you can have a specialized holding player, and a linking player. You can provide a solid base to protect your defence and begin attacks with this pair, and it can be a little more defensive than in a 2-man midfield. Ball-Winning Midfielder (Defend) – as long as partnered with a DLP(S) to cover position. Note, I would recommend the “Attack” duties in the AM position to help the balance of your team. But that is not to say the support roles won’t work either – this depends on your set up. So there is a way of providing adequate defensive cover, support in linking the play, and possible overloads in the final third, and overall creativity. With a balanced central midfield. As I touched upon earlier in the article though, you need to consider how each role and duty affects the other positions. If you play with a Central Midfielder on an “Attack” duty, then you will need to sacrifice an “Attack” duty in the forward line (either STC or AMR/L positions) in order to balance the movement, and create link ups. The “DM” Triangle is an invert of the “AM” Triangle, based with a single holding player in a good defensive position at the bottom, and 2 more creative players in the MC strata, aiming to support the attacks more. You can have an interesting “false” holding player too, and have the real defensive player sitting in the MC strata, a dummy that you cannot use in the “AM” Triangle. This would consist of having a support role in the DM strata, and a defensive role in the MC strata. Once again, a mix of a defend, support & attack duties would help balance your midfield to achieve your 4 aims. Pick 1 defend duty and 1 support duty, in either position, then add 1 more player from below, as your creative outlet. Box to Box Midfielder (Support) *if you are insistent you do not want an attack duty, then a Box to Box Mid will at least get forward most out of the Support duties. This will again help your balance your midfield. Meeting your 4 aims. NOTE! Your central midfield has to provide defensive cover as a first priority, but this does not mean you can neglect the forward runs, link play & chance creation needed too. You need to pick roles to cover all of these. It is harder to cover them all effectively in a simple pair, so defensive cover is the first priority, as creativity/forward runs can come from the flanks instead, but the defensive cover cannot be replicated on the flanks instead, so is essential. A 3-man midfield is generally more effective in a triangular shape, with a balance of duties. It is easier to meet all 4 aims with this type of set-up. Your duties will knock-on to other positions though.You cannot afford to have an AMC and STC both on an Attack duty, and the AMR/L as well, it will isolate your attack, so balance Attack, Support and Defend duties through different strata in your team to create the movement and structure to help your team. Your wide men consist of Full Backs / Wing Backs and Wide Midfielders / Wingers. Most teams will have 2 sets of wide players, some will contain only 1 set of wide players. Your wide players have a very varied set of roles and encompassing all types of duties. There is a lot of potential for variation in your team in this area of the pitch. The formation you use will significantly impact on the choice of roles and duties in the wide areas. A solitary wide player has more responsibilities and has to be able to contribute to all areas of play, whereas a pair of wide players can share the specialisation for a more balanced set up. Sacrificing wide players is a way of having more midfielders to win the possession battle, however wide men used well can contribute to a possession game, a creative game, or be used for their goalscoring exploits, or even their work rate and defensive abilities – this applies to all positions down the flank. A full back who gets into superb advanced positions is a great asset to have, as is a winger who tracks back and makes tackles too. A formation consisting of lone wide players automatically begins to restrict your roles and duties significantly. A defend duty significantly reduces the contribution a wide man can make in a system where he is expected to get all the way down the flanks, as well as defend. Wide men in systems with only 1 player on the flanks typically come from the more defensive positions, to retain a good defensive shape, but then offer an outlet as the team moves into transition/attack phases. A wide man in the AM strata is highly unsuitable for this job as he exposes his team with too much space behind himself, and provides less tracking back or help in the midfield battle. So typically the wide men will make several forward runs, but will also tend to be in a deep enough position to offer the defensive cover. The further forward you place your lone wide man (i.e. wide midfielder instead of full back), the lower your duty should generally be (support instead of attack) to ensure that the wide man can cover and link play with your defence as well as midfield and attack. Crucially the wide man here must do everything, so he cannot sit and defend only, or look constantly to get into the final third and shirk his defensive work. – or, having the wide midfielder come inside as a goalscorer/creator/passer, leaving the full back / wing back to provide the main attacking outlet, whilst the wide midfielder can still offer defensive cover on the flank too. If you play dual wide men, you should almost certainly select 1 in the full back positions, as otherwise a wing back can leave space behind trying to sit further forward than he needs due to the existing defensive cover provided by a man playing in front of him. Caution should also be taken with playing wing backs with a traditional winger, as this rarely causes the desired overloads, and more often simply leaves 2 players upfield, exposing your team to the counter-attack. The wing back tends to suit having space to attack, whereas if you play a traditional winger a more traditional full back will provide a better outball and cover. The 1st combination is a traditional option of more defensive player behind more offensive player, and is a very stable option. The 2nd combination will have a player staying wide, but holding his position / the ball far more, and can be asked to sit narrower, to provide more space for the advancing full/wing back to move into and overlap. The third combination is a variant on the traditional option, with the full back pushing on to form overloads with the winger, but with 1 player sitting deeper / narrower than the other during these moves to encourage good link play and overlaps. The 1st combination will be for the full back to advance from deep into space vacated by the IF/AP. If you are playing a wing back, you may have much better movement and defensive cover by ensuring the WB & IF/AP have opposite duties (Support-Attack or Attack-Support). If the IF or AP has a support duty, they will tend to tuck inside earlier on, in a deeper position, so it is important the FB/WB offers an outlet earlier on in the move. The 2nd combination enhances the importance of this, as the CWB will need cover from midfield & the man in front to provide tracking back, should he be caught out of position. The CWB will tend to get into the final third early, and an angled reverse ball into the path of an IF/AP(S) can allow him the space to make more penetrating runs. If your IF is on an Attack duty he will tend to be playing more as a goalscorer, so wide support is generally required from the full back, although this burden can be eased by a centre-forward or playmaker drifting wide to offer an outlet. NOTE! Plan first how many wide players you are using before you decide on their roles. If you are playing a lone wide man you cannot afford to have them doing a defence-only job, they must offer an outlet. Consider that they must also have a good defensive position to begin with, or be able to track back and defend instead. Dual wide men must work in combination, ensure they do not get in each other’s way, yet are still capable of providing overlaps and overloads. The term “strike partnerships” does not simply include only the forward(s) in the ST strata, it also includes the Wingers and Attacking Midfielders who have a particularly close link to the Centre-Forward(s). All Strikers have a partnership of some description, even lone forwards require supply and link-ups of some description to function. Football has moved from specialist to universalist theories of roles over time, with the roles demanding more of each player, to be able to fulfill additional requirements. The attempt to find space in modern tactics has also necessitated the need for more unconventional partnerships too. In this guide I will look at various types of pairing, a concept entirely applicable all pairings, from lone forwards with AM strata support to a simple a pair of forwards. Many partnerships over the years have been build on getting the best out of the physical prowess of players. A large player can provide an effective target, holding the ball up or playing passes to a quicker team mate, or playing him in behind instead. The larger player generally plays deeper, flicking on the ball, winning aerial challenges, although it is possible for the larger player to stay higher up, flicking the ball back into space or to a teammate, coming in at pace. The smaller player can look to break in behind or into pockets of space, often created by the larger forward beating a defender to the ball. These partnerships generally rely on good wide delivery & crossing from wingers and full backs, and generally suit fairly direct tactics. There are generally Target Man & Poacher combinations. Although an Advanced Forward can provide a more rounded version of the Poacher, and the Bigger forward can still be effective in a more creative role if he possesses the skills, e.g. Deep Lying Forward or Complete Forward. Probably the most common type of partnership in football. This can simply be a case of 1 forward sitting slightly deeper than the other, providing his more advanced partner with passes and through-balls to score, or occupying defenders to allow his partner to gain more time and space. The creator can exist as a forward, or as a midfielder instead, positioned to assist the striker effectively. This type of system can rely on a number of attributes, not just necessarily physical, but technical ability and mental ability become more prevalent in cases of creative partnerships. It is a type of football that is fairly versatile, but has a slight tendancy to suit more creative/possession based systems as opposed to direct, attrition football – however its versatility can see it widely applied to many different systems. The most balanced roles for this type of partnership are Deep Lying Forward & Advanced Forward (AF), however a Complete Forward can be an exceptional creator or goalscorer (or both), generally shaped by his duty. A Poacher is obviously a good goalscorer, but is less likely to feed back in his supporting partner in space. A Trequartista is a superb creator, and needs someone capable of attacking the space & chances he creates. He can function from ST or AMC positions, but an Advanced Playmaker can also be a superb deeper (& wide) creative force to supply an Advanced Forward ahead of him. The AF is a role that offers build-up play, as well as goalscoring ability; the CF(A) & DLF(A) are good examples of this too. The Inside Forward can be an excellent creator on a support duty with angled balls from out wide into a breaking forward instead, whereas on an Attack duty, he can attack space left by a more creative forward in a more advanced position ahead of him, and be a prolific goalscorer. The false nine and false ten system are based on the central striker dropping deep, attempting to draw a defender with him, or simply allowing space for him or a teammate to attack and unsettle the defence. The false ten aspect is the advanced midfielder pushing from deep into the vacated space to emerge as a significant or main goalscoring threat. The main and obvious way of achieving this is to select a False Nine and Shadow Striker partnership, which will link up well in the final third, and tends to significantly suit a possession and intricate movement based system. There are other roles which can mimic this effect, sometimes by pulling wide instead, or simply drifting for space. The Trequartista in attack will naturally drift around, creating space that players can attack, and again this can cause the central defenders the conundrum to follow him, or allow him space. The Trequartista can drift wide too, whereas the False Nine tends towards moving deeper. The Deep-Lying Forward & Complete Forward (Support) will also act similarly, but are more capable of holding the ball up, and occupying more space higher up the pitch as opposed to constantly looking to move deep. They also have more defensive discipline than a Trequartista which can be an important aspect for many managers. In terms of alternative “false ten” players – the Inside Forward on the flanks can attack the space vacated by a forward dropping deep / drifting wide, and cause the dilemma for full back’s to choose to follow the player, opening up space wide, or to leave him to the central defenders, where he may gain space before he is even tracked. Attacking Midfielders can push into the box to support attacking moves, but are less suited to a prolific goalscoring role than the others outlined. NOTE! Remember to split your duties to create good movement. Base your attacking chances around multiple routes of attack to prevent unifocal tactics being rendered useless by the opposition. Your attacking partnerships and link-ups extend to the AM strata, as well general creative & running support from deeper midfield positions too. Have a partnership to suit your team’s abilities and style of play, and make sure you have plan B options too. The argument of Philosophy has raged since wwfan’s 12-steps guide, and it has been fairly ground-breaking, if not common sense. It helps us see the Philosophy in a new light, it is not simply a creativity argument, it is the debate of specialism versus universalism, something that readers of Jonathan Wilson’s Inverting the Pyramid will be familiar with. It is an article I am covering elsewhere in the next few weeks too. In essence a very rigid team is full of specialists, with each player’s job being rather specific, whereas a very fluid team is an universal approach with all players subscribing to the team game and instructions. Overall creative freedom is higher in a more fluid system, because there are less specialists to be singularly responsible for creativity. In short, if you want individual player’s doing individual jobs (goalscoring, ball-winning, playmaking) then you need a more rigid approach, or if you want a team ethic to pressing, playmaking, etc, then go for a more fluid approach. Your team possession instructions are very variable. If you want a possession orientated system, then shorter passing helps to create the overall style, whereas ball retention acts more like the old shout, looking to considerably reduce passing range to simply being an exercise in ball-control, this can leave you blunt in attack, but it can also allow some of your more creative players more time on the ball to work an opening. You can add to this by asking your team to play out of defence, ensuring that your team does not lose the ball lumping it upfield, trying to keep it amongst the defence until openings into midfield become available. If you use possession as a defensive tool, then this is quite important. However if your possession-based team is trying to counter-attack, or simply play in a defensive manner, trying to clear their lines, then this can be very counter-productive. The direct passing option works in reverse to shorter passing, it aims to move the ball from defence to attack in a swift manner, with go route one a very direct option, to get the ball into the forward lines in an even more swift and urgent fashion for rapid transition. You can elect to ask your team to pump ball into box for Pulis-esque long-ball football to aim for the big blokes up front, in the centre, or if you wish to play a quick transition down the flanks, often in a counter-attacking style, then you can ask your team to clear ball to flanks, to try and pick out swift dribblers to carry the ball forward at pace. It is also a potentially useful way of getting your team to clear their lines late in the game to hold onto a result. You can modify the use of possession further, by indicating if you want to play more through balls in behind a defence, with the pass into space option, which works well against a high line. If your opponents sit rather deep you can try and unsettled them by asking your team to run at defence, in the hope of drawing some space or wriggling through a compact line. You can also ask your team to either wait for a perfect opening to score, or to try their luck whenever possible; work ball into box asks your team to not waste possession with pot-shots, but shoot on sight asks your team to make the most of any opportunity, useful if you are struggling to create any chances, often through a compact defence, or wish to test a weakness in the opposition goalkeeper. Your team’s use of crosses is important in possession-terms too. Traditionally quick forwards can be aimed for if you drill crosses, this is simply to get something at the end of it, and aims for a nippy forward to get ahead of the defender at the near post to nudge the ball in. This delivery is often better from the byline, or at least no further from the byline than the edge of the penalty area, as the ball is meant to be low and quick. You can make the most of a tall forward if you float crosses, which gives the larger player time to set himself and attack the ball at its highest point, potentially beating a shorter defender, often this is delivered from deeper so it can hang in the air, and also because it does not require much pace on the ball. You can also hit early crosses, which means floating crosses from much deeper, this can support a direct style of play, and it can help get the ball to your forwards from wide if your wide-men are struggling to get past their opponent, allowing them space and time to find their teammate. Penetration refers to how you break through an opposing backline. Certain formations; with central playmakers, runners from deep and forwards on the shoulder of the defence suit playing through the middle. If you have a numerical advantage in the middle, it makes sense to exploit it, as it does if your chief playmaker is in a central position too. You may have a solid, but unspectacular central midfield, or a numerical disadvantage of a 2-man midfield pairing, so the majority of creativity will come from your wide-men and their passing, crossing and/or dribbling abilities, in which case exploit the flanks is a more pertinent point, especially if you are playing a wide playmaker as your only midfield playmaker to ensure he gets on the ball. You can exploit left flank, or exploit right flank if you wish to take advantage of a weak opponent, a formation weakness, such as lone wide-men, or to mask your own weakness down a certain flank. Exploiting a single, or both flanks can be very effective in a counter-attacking system for rapid transition. If you face a compact defence you can look for overlap to try and create numerical overloads in wide positions, which can help create space for teammates and get more balls into the centre from wide positions. It relies on good energy and delivery from wide, but can be very effective at breaking down a stubborn defence, although it can blunt the directness of your wide-men who tend to hold the ball up and wait for support and combination play instead, this can be a big problem if you like your wide-men coming into central attacking positions in the final phase of a build-up. Your team’s shape is partly inherent within your formation; i.e. central midfield dominance, high pitch coverage, a low block, a wide midfield strata – all caused by what formation you use. Your shape affects both the way you attack and the way you defend. If you play wider you can often look to stretch the pitch and use more of its width, but it can also cause your defence to sit wider too and create holes, although sometimes that can give good pitch coverage if you want to press heavily all over the pitch. If you play narrower you can compact play into central areas, this can make you easier to defend narrow against in return, but creates less holes between your defenders. A high or low narrow block can both be effective defensive tools, depending on your opponents and approach. Your defensive line looks at how high your team sits up the pitch, ranging from a push higher up & much higher defensive line to compact play into the central third of the pitch, leaving little room for your opponents, and in the case of slow forwards, forcing them to rely on pace they do not have, to drop deeper & much deeper defensive line to sit closer to goal, leaving little room in behind for quick forwards, but taller forwards may profit from this. This leaves more room in the midfield area too, but can be used to draw opponents closer to you, opening up room to counter-attack into. You can ask your players to roam from position, which can cause overloads or get your players drifting into areas of the pitch with space to cause problems and receive the ball. The downside is that your players can get caught out of position defensively. Conversely, you can ask your players to stick to position, but that can make them easier to be marked out of the game, although it provides a more solid defensive structure. You can allow wide players to swap positions, which has the added link-up with setting individual player instructions and roles, allowing you to swap your left and right-footed wingers to get them to go round the outside of your opponents instead of trying to come inside them. This works well if you maybe want to exploit space round the outside of a packed defence before your opponents can react, and vice versa. Defending links very closely with shape, if you have a high block, then using an offside trap can help negate the problems of being caught in behind by fast players, although it can be hard to make the trap work if you use a Stopper-Cover split, or a Sweeper in behind. The high block also works very closely when you hassle opponents, to reduce their time and space, in an already compacted area. If you wish to specifically prevent individual players from getting any space, then tight marking or specific man marking can enhance this. If you prefer a low block and remaining compact, then the offside trap is far less effective, as there is less chance being caught in behind, and can allow players space closer to your goal. A particularly shape-focused team can choose to stand off opponents, not closing down the opposition, and simply being hard to play through instead, although this can leave your team long periods without having the ball, it preserves more energy. Your tackling strategies link closely with pressing and shape too – if you want to press high then get stuck in is more appropriate as it again, reduces time and space for your opponents, but it can concede a lot of free kicks, and quick, agile players can ride the challenge and find themselves in space. If you wish to stay on feet, then this is more appropriate in a low block where you try and keep shape. If you do not press in a high block, then the opponents have time to simply play a quick forward in behind. Your tempo is linked heavily with passing style – a team that plays in a direct manner will look to transition the ball swiftly from back to front, and that requires a high tempo, to increase the urgency. A short-passing style is much more considered, and works best with a low tempo, waiting for the opportunity, rather than forcing it. Occasionally mixing tempo can help your short-passing into quick combinations to earn some space, and sometimes you can play a direct game, involving simply taking a few moments longer to spot the run from deep if a teammate. However, the general rule is short passing + low tempo and direct passing + high tempo. Your team’s creative freedom, to adhere to instructions more, or make their own decisions as they see fit is allowed too. You can allow your team to be more expressive, if you trust their creativity and decision making more, or be more disciplined if you prefer them to play simply as instructed. This ties in with philosophy (above). You can ask your team to take a breather, to rest with the ball, useful in physically demanding games (depending on conditions, intensity etc), and in a more defensive strategy to waste time, a typical tactic late in the game, when holding a result. You can also ask your team to take more risks when overloading in search of a goal, allowing highly enhanced decision making and attacking intent. Conversely you can ask your team to play even safer to take less risks and simply keep the ball out of your own net – i.e. not double-Cruyff turns on the edge of your own penalty area with 3 attackers close by. You can read part 7 of the Pairs and Combinations article about how llama3 builds his team and put all knowledge from above together for creating a better Football Manager Tactics in the chapter about Building My Team. A pdf file which lets you download or read the complete guide to Football Manager player role combinations and duty pairs. It is updated for Football Manager 2015 with new player roles and more great tips to making a specific playing style work in FM15! This article was written by the SI moderator Llama3. 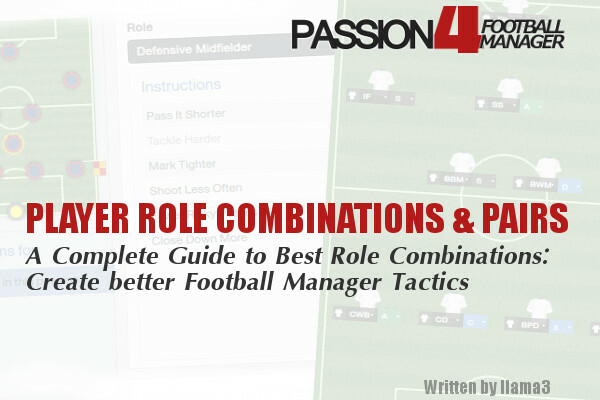 Passion4FM would like to thank him for writing this excellent Football Manager guide on pairs and player role combinations in Football Manager and for letting us re-distribute it on our website to our audience. The original version of this Football Manager guide can be found on Sports Interactive Community forum – Sigames.com. There is also an updated version for Football Manager 2015 which you can read/ download by .pdf file above. 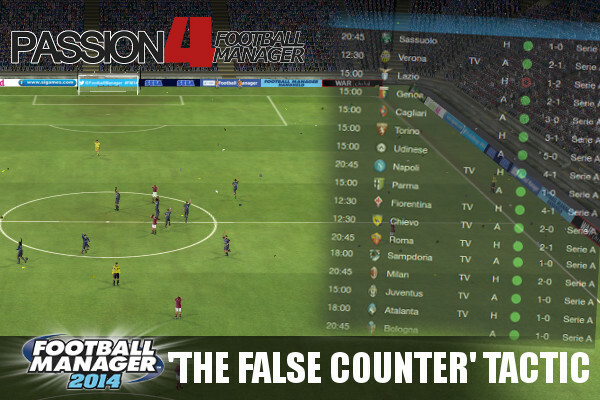 The original thread for the the complete guide to Football Manager 2015 player role combinations and duty pairs can be found here.